Cut from steel, our Kokopelli bathroom accessories are available in two lovely finishes: rust (a burnished brown) or patina (a coppery color with splotches of turquoise which is shown in the photo above). Each substantial towel bar or bathroom fixture comes with matching screws. Perfect for your southwest, rustic, western or Kokopelli decor. Our Kokopelli towel hook, towel ring or Spirit Horses towel hook look great in the kitchen as well. Use it to hang your hot pad holder. In your Kokopelli bathroom, you can use it for your bathrobe. 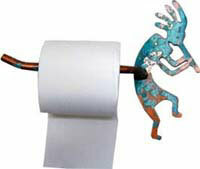 Kokopelli Toilet Paper Holder measures 11.5 inches wide (from the tip of Kokopelli's flute to the tip of the toilet paper bar) and 9 inches high. "I received the towel bar and toilet paper holder today. I must say, your products are lovely. So sturdy and well made. As my husband said, "No one else will have these." Take care and thank you once again. By the way, the toilet paper holder was made the perfect size to fit in the smaller area." Prices do not include shipping. All items are shipped via UPS Ground. Order your Spirit Horses or Kokopelli Bathroom Accessories today!